What do you top a Soot Sprite Christmas Tree?? With a Soot Sprite Angel of course! I was on my way to bed last night and I thought how surprised my kids would be if the Totoros, the Catbus and a Soot Sprite Christmas tree were waiting there to greet them at breakfast! So I got to work making those tiny soot sprites, I made a dozen of them and that really took no time at all. 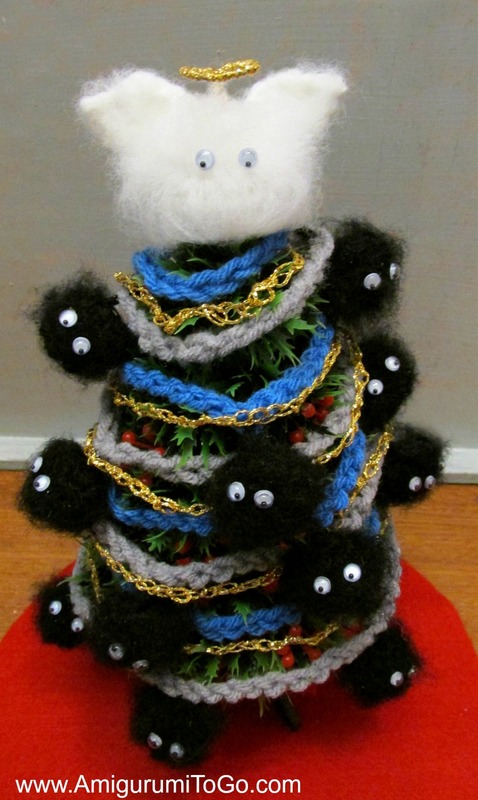 But I had no idea I would make a Soot Sprite Angel until I tried everything I could think of and nothing looked quite right on top of that little tree! Once the idea came to me the rest fell into place. And I think I actually giggled out loud when I put that Sooty Angel in her place of honor, she just looks like she was always meant to be! COOL!!" once or twice, lol Yup, that just made my morning!! I used a small tree I found years ago at a thrift shop. It's been used in my daughter's dollhouse a few times. I made the garland by chaining long lengths from blue and grey yarn. I made a golden garland out of gold metallic punch embroidery thread. I love the looks of all 3 together! 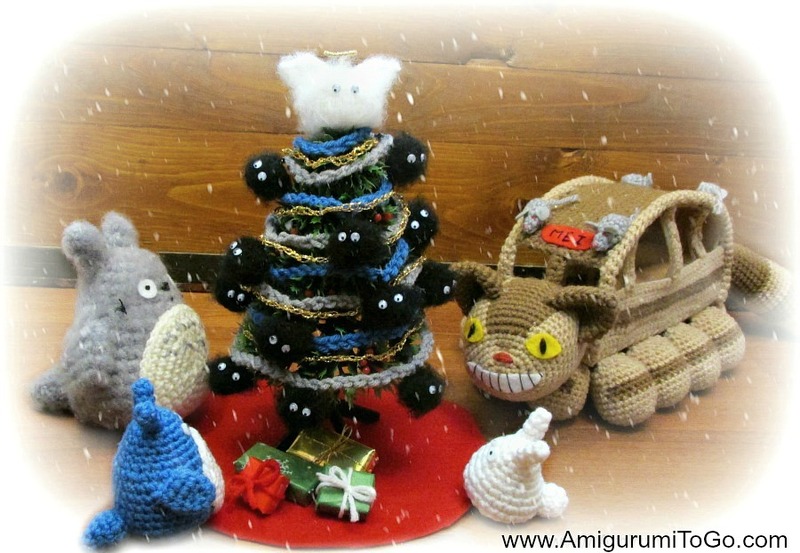 Then top everything off with tiny Soot Sprites and it's the perfect Totoro Christmas Tree! I'll include the tiny sprite pattern below, it's stuck in my head after making a dozen of them so it's easy to write out and the Sooty Angel body is the same pattern as my larger sprites but I can't remember off the top of my head how I made the wings ( I remember how but not the # of st counts) .. I'd have to take a few moments and figure that out again. But everything else are free patterns! f/o leaving a long tail. Weave in and out through the remaining st, do not pull yet. Brush the yarn all over until it is all frizzed out. Stuff the doll with either stuffing or black yarn. I actually stuff mine with black yarn and it works great, especially if you need to brush it more, no stuffing gets pulled through and no stuffing shows through anywhere. Once it's fully stuffed pull the yarn tail to close the gap. Knot off and carry the yarn tail right through the middle and out through the top. Figure out where you will put the eyes, you'll need to snip away the fuzz in that area. Glue on 2 small pieces of white felt and dot in black pupils with a pen or paint. Or use tiny wiggly eyes. Cut the yarn tail free now and brush out the doll a bit more to frizz it some more. Soooo cute!!! the wings look like they could be fluffed cat ears? I love the soot sprites, they are so adorable, their little eyes are so cute, and I too would like the pattern for the soot angel. I asked all my grandkids what their favorite animal was, so I have projects lined up for next year. The only animal that wasn't on your animal list was a chipmunk. Thanks for being such an inspiration and a motivation for me! 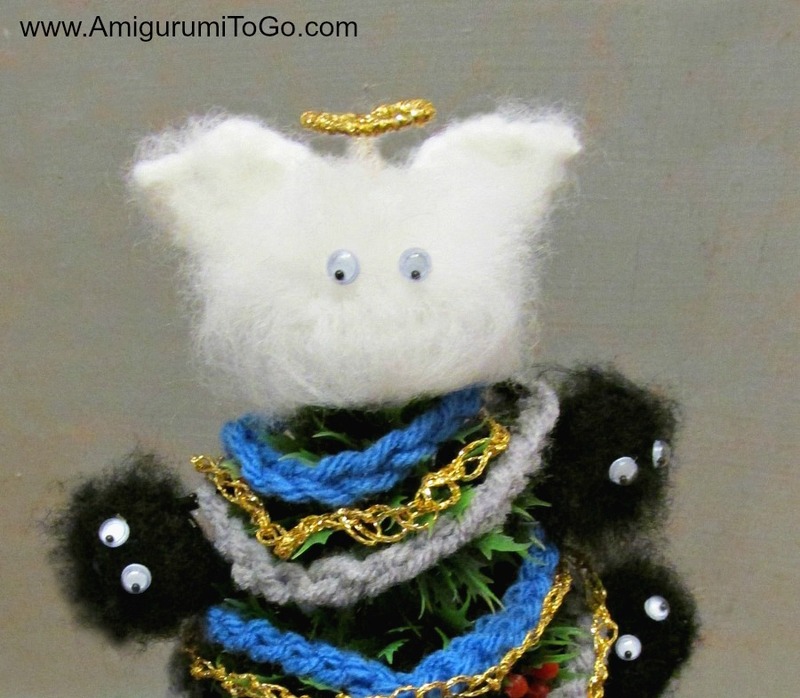 I was wondering if the pattern for the Soot Sprite Angel Wings is available? This little tree is adorable! Thank you so very much!